Wherein two young adventurers return home from their first paying job to find that their hamlet has been raided repeatedly over the last days. Returning readers will remember the Chapter-posts from the Pius Chronicles, and I would just like to mention that I will be playing with the format a bit in the LL-reports. After having guarded a merchant's wagon to the market in Swordfall, Jiminy and Kael discover that villagers have barricaded the hamlet of Barrelhead. They're quickly told the story behind the recent troubles - a week ago the village was raided by goblins. Since then it and the surrounding farms have been hit almost every night. So far, one of the villagers have been killed and one seriously wounded, and the two Miller girls have been abducted. Goods and livestock has also been stolen. As both our two heroes have chosen adventuring as careers, they decide to seek out the little bastards and put an end to their misdeeds. 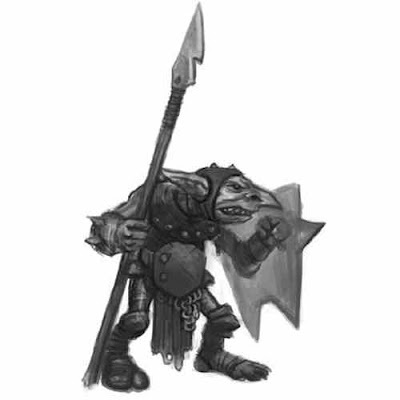 The villagers believe the goblins must be holed up in Ogre Hill, some half dozen miles north east of Barrelhead. There should only be one cave up there big enough to shelter a band, although it was closed down six years ago when the Legion cleared out the goblins from these parts. As both grew up in the area, they make good time when they set out. When they close in on the hill, they find sign indicative of recent traffic. It being noon on a clear summer's day, they do not expect a challenge in the open, but still they proceed with caution. Even so, Kael steps in a punji pit, not once, but twice. Not to be daunted by such shenanigans, the heroes press on. What gave them pause was the small humanoid skull, fresh enough that it still attracted flies, at the cave entrance. It made them think of the missing girls, and hardened their hearts before they delved into the darkness. This being my first session ever with LL/AEC, I used it to get a feel for how the system runs and for the balance. Yes, I know game balance is a four letter word in certain parts of the OSR, but I happen to think unnecessary deaths are unnecessary. And I certainly don't want to kill off a character just because I don't know the strength of my monsters. 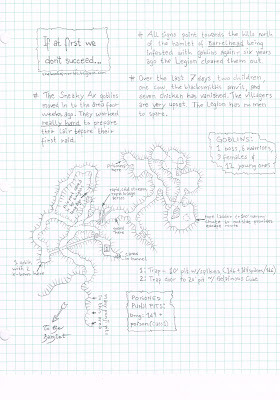 The dungeon crawl went well, and we got to try out the challenge resolution. With the lack of skills, we did what so many groups have done before us -- the heroes prodded, brushed dust aside, and pried apart planks to find secret doors and traps. As I've said before, OD&D and retro-clones can have a lot in common with Storytelling games. The party consisted of Jiminy Trinkets, a 1st lvl. Gnome Illusioninst, and Kael the 1st lvl. Human Fighter. Kael's player had the brilliant idea of buying some dogs to bolster their ranks. He didn't have the cash for a trained war dog though, so as it turned out, Jiminy bought two war dogs, and Kael settled for a guard dog. This proved fortuitous, as a couple of 1st lvl. characters without a cleric or even a measly potion of healing are somewhat easy to break. The dogs also provided a lot of comic relief, as we used their Morale rating and rolls vs. the character's Charisma to determine their actions. One of Jiminy's mutts turned out to be a bit of a wimp, while the other would charge through darkness just to rip a goblin's throat out. Oh, yeah, and infravision rocks! On toast! 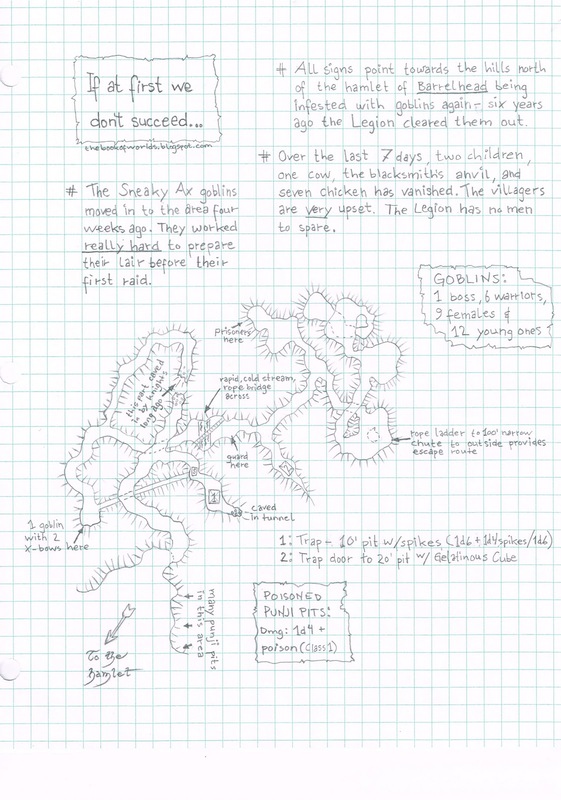 The desperate fight on the far side of the underground river left the goblin boss and his warriors dead. Despite his wounds, Kael managed to repair the rope bridge and get Jiminy and the remaining dogs across. The dogs now lead the two adventurers towards the goblin lair, but at a fork in the tunnel, Kong became very agitated. He seemed to want them to chose the left path, while Pookie, her fur matted with goblin blood, clearly wanted the right path. They ended up following Kong at this junction, and within minutes they found a chamber with a crude cage at the back. The sun be thanked, the two girls were alive and relatively sound. The naked and heavily bruised elf they shared the cell with was another matter. Even so, relieved that the children were safe, Jiminy and Kael now turned to clearing the rest of the cave. In the next chamber, the gnome's infravision revealed a handful of shapes, all smaller than the warriors they fought so far. These creatures appeared to disappear into the cave's ceiling one by one. Pookie didn't need any encouraging, and as the massive dog bore down on one of the shapes, there were screams of panic as the rest scurried frantically upwards. Jiminy rushed forwards, just in time to stop her beast from tearing the life out of the young goblin. Interrogating the critter proved to be easy, and in no small way aided by the large, bloody, snarling dog that refused to back away from the whimpering youth. He stuttered and cried, but answered all questions as if his life depended on it. It didn't take them long to find out that when the boss got killed, the females and the younglings, as well as the last remaining warrior, dropped everything and fled up the chute. in the end, compassion trumped thoroughness, and the terrified youngling was sent after his kin. A while later, our heroes emerged into the evening sun with the rescued prisoners, their bags filled with the goblin hoard. All in a day's work. "As I've said before, OD&D and retro-clones can have a lot in common with Storytelling games." I look forward to reading your session re-cap in a meeting a little later today. Yeah, I find running LL to be quite interesting. Since Saturday's game I've been marinating on which narrative elements from 3.X and ST I could and should integrate. There're the level restrictions to consider, but then again, given the lack of skills, there really are no (or very few) mechanical inhibitors on the non-combat actions. I find it very interesting to see how different I go about GM'ing LL/AEC now, compared to AD&D 2E back in the early 90's.